GB Tell me about this sculpture and why you chose it. 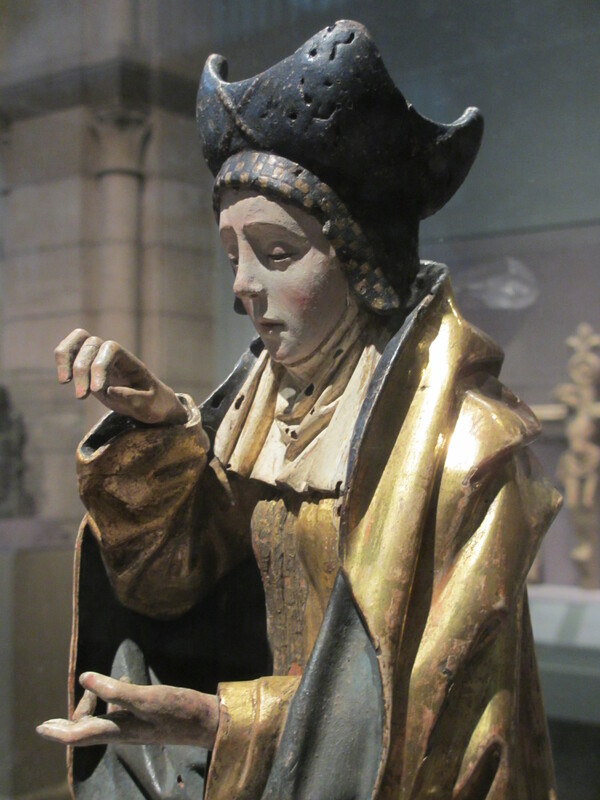 TS It’s a holy woman carved from walnut with polychromy and gilding, from the South Netherlands. She was carved and painted in 1480. She’s in the medieval gallery at the Met, which is one of my favourite places in Manhattan. I’m choosing her partly because she’s very arresting to look at but also because she’s very old and like all European expats in America I’ve come to fetishise old European things. And part of her beauty is that she’s survived intact since the 15th century. GB Do you find it a beautifully crafted object or are you more interested in the history? TS It’s definitely the craftsmanship too. A lot of people nowadays don’t like polychromy in sculpture because it makes the figure look somehow doll-like so it now tends to be used only in a kitsch or ironic way, like the Jeff Koons polychromed wood pieces in the Warhol exhibition upstairs. I think this holy woman is a really successful, sincere use of polychromy as she looks as though she has an inner life. She has her eyes almost closed and her lips almost parted as though she’s been caught in a moment of genuine contemplation. GB Do you think people find gilding kitsch too now? TS Yes, I think gilt has become associated for us with gaudiness and materialism whereas there was a whole Gothic aesthetic in the medieval era that associated preciousness with holiness. There was a long history of making these elaborate, gilded, jewelled reliquaries for the relics that were their most holy objects. Then the Gothic architects built versions of those on an incredibly grand scale like Sainte-Chapelle in Paris. That whole aesthetic is lost to us now but it was the context in which these sculptures were created and part of what’s beautiful about them now is the pathos of all that being lost and them ending up in the middle of Manhattan. GB So does the fact that she’s holy make her more beautiful to you? TS You don’t have to believe in her holiness to appreciate things like the way in which the sensuous drapes of the fabric in her robes suggest a perfect alignment of the physical and the spiritual. And you feel she has such a powerful integrity that you’d never want to touch her and violate that. I visit her every time I go to the Met so in a way she still has the function of being a devotional object. TS I used to think that something had to be pleasing to look at but also emotionally and intellectually engaging but I don’t know if I believe the intellectual part of that any more. Once you have a baby you think this is the most beautiful creature you could imagine on earth but there’s absolutely nothing to be said about it – and that makes you appreciate beauty in an entirely new way.